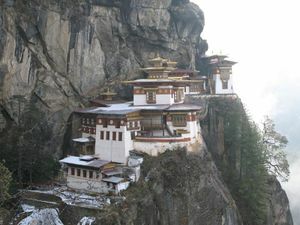 Taktsang Monastery or Paro Taktsang (Tib. སྤ་གྲོ་སྟག་ཚང་, Wyl. spa gro stag tshang) is situated on a nearly vertical cliff at 3,000m altitude north of Paro in Bhutan. It is one of thirteen Tigeress’ Lairs (Tib. 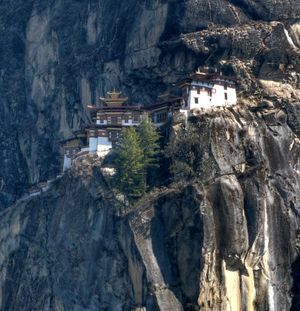 Taktsang)—the places where Padmasambhava manifested in the wrathful form of Dorje Drolö. There, Guru Rinpoche meditated on the Kagyé cycle. After him, many great masters practised there, including Milarepa, Padampa Sangye, Machik Lapdrön and Thangtong Gyalpo. This page was last edited on 22 February 2018, at 22:10.